In the mid-19th Century Europe, (especially Britain) and in the United States, the main exposure most people had to major musical works of the day (before recordings) was through performances by local or touring bands. Brass bands were a response to industrialization, which produced a large working class population, and technological advances in instrument design and their mass production. Many of these bands were sponsored by various industrial concerns, especially in the coal mining areas of the UK. 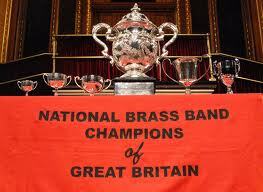 In the mid-1800’s there were over 750 brass bands in England and today number in the thousands. While brass bands continued to be popular in much of the rest of the world, in the United States, they gradually began to disappear in the early 1900’s. Concert bands, with additional instrumentation such as winds, as well as many competing musical styles such as jazz, contributed to the decline. Brass bands, including the traditional British Brass Band are now in rebound. There are well over 100 active brass bands in the United States today and growing. While there are a few professional bands, most of these are community based organizations. A significant part of the brass band popularity has been and remains competition. Early on they provided a much needed “community identity” and today serve to stretch the talents of the local bands. Various challenges, such as the US Open Brass Band Championships, and organizations such as NABBA (North American Brass Band Association) continue to contribute to the growth of brass bands in the US. The early Salvationist, as today, took their Gospel message to the people in their own environments, in the streets and markets of small towns. More Army bands appeared until, in 1891 the Salvation Army established the International Staff Band. 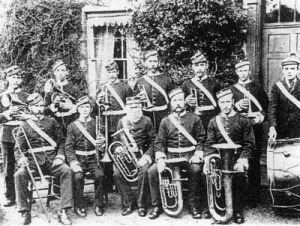 Although the Army bands remained distant from their secular cousins, by playing only their own music and avoiding competitions, they had a significant influence on the growing brass band movement. Their music, to this day, continues to be used by brass bands around the world. Besides the obvious, an ensemble of various brass instruments, there are more rigorous descriptions of a “brass band” such as the US Open definition. The most popular form, only slightly different, is that of the “Traditional British Brass Band.” See more on this at “British Style” Brass Band. Note: The above information was a brief summary from various websites.